I came to Istanbul with no idea what I would find, but if I was worried about culture shock, that fear was quickly dispelled as soon as I dropped off my bags and headed out for dinner in Sultanahmet (the Old City) with a some new friends: halfway through our first beer, the bar across the road (Cheers) started pumping out The Nosebleed Section by The Hilltop Hoods. So here I was in Turkey boasting about an Adelaide band to a Melbournian living in Istanbul and two Americans travelling through. So if not culture shock, what was there? Well, there was a lot of walking. It’s stupid to write something like “Istanbul is a very walkable city”, because Istanbul is enormous, and there’s no way even a dedicated pedestrian like me can get around it all on foot. But then, I’m not here to see every inch of every street in this city of over 13 million people. And the bits I am here to see are for the most part thoughtfully lined up along the tram line (which you can easily follow alongside on foot), and especially collected around Sultanahmet. Plenty of Istanbul to walk around. So speaking as a tourist and not a local, I’ll stick with my assessment that Istanbul is a city to be experienced on foot. Not just because it’s convenient (the trams are convenient too, with their token system where you just put your two Turkish lira into the machines just outside each station and then immediately use the bright orange token they reward you with to get in at the turnstile), nor just because Istanbul’s fantastic weather means you’re spending some lovely time outside in the brilliant sun, nor just because part of the experience of being in Istanbul is being in the middle of its vaguely crowded open spaces. But also because that way, you don’t feel quite so bad about the unfeasibly large quantities of baklava and kebab you ingested the previous day. In all honesty, there’s not much to write about our adventure into Asia. It was a fun day, and definitely worthwhile: we walked through some interesting areas, and it’s good to see how people live in a city, rather than just what other tourists do in it. The palaces on the Asian side weren’t worth the trip (since they happened to be closed that day), but the yoghurt that my companion’s guidebook recommended in the cute little waterside suburb of Kanlıca was – a particular highlight of the day. Never had yoghurt covered in icing sugar before. Full of win, and washed down with a tasty Turkish tea. My other days on foot in Istanbul were mostly extended strolls around the big tourist attractions. But when you’re done wandering around the tourist attractions, pick a random pretty side street and walk down it. Enjoy the feeling of being in a city with a different culture. Pick another random pretty side street. Lather, rinse, repeat. This is how I wandered down from the ruins of the old Roman aqueduct to the water and discovered a series of lovely parks full of locals, including many fishermen – and, uncultured heathen that I am, it was interesting to see elderly women in niqabs laying out rugs in the park and praying as their grandchildren fished and played. 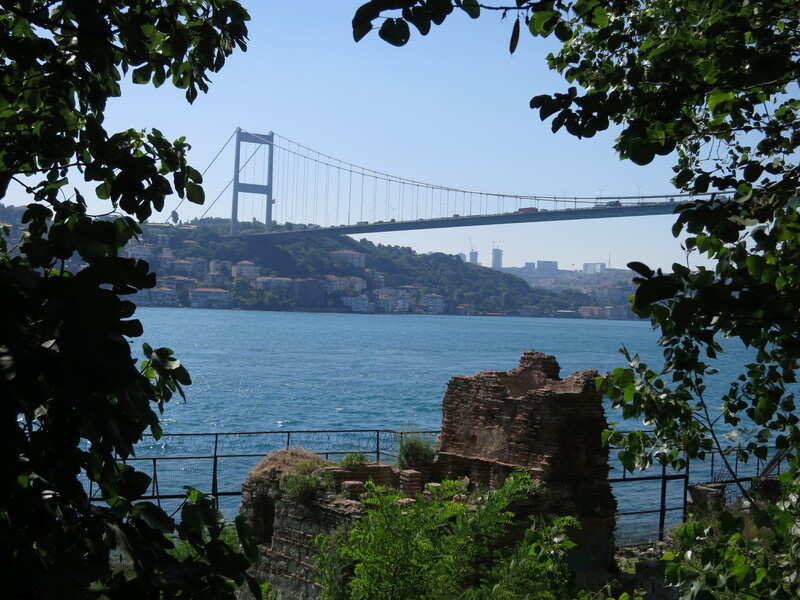 It’s also how I discovered the Gulhane Park next to Topkapı Palace, which is a great place to sit and read a book after a hard day’s walking. And of course the bazaars – the Grand Bazaar and Eminönü Spice Bazaar – are both walking experiences where the whole point is to roam around and get lost. 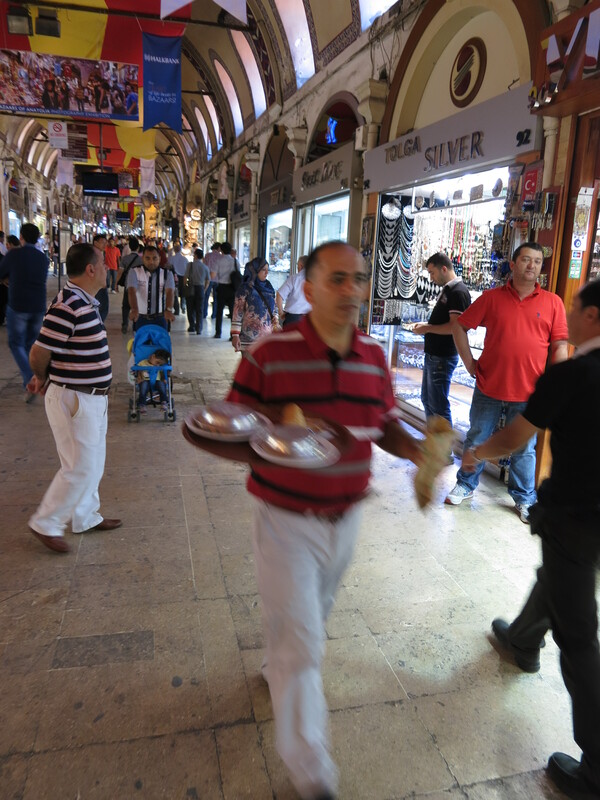 The Grand Bazaar is especially good for this: we ended up with a hugely entertaining half hour or so of us almost stalking the guys running deliveries of Turkish tea and doner kebabs around to all the other stall owners in the bazaar. And then further entertainment ambling through the Spice Bazaar being hawked various concoctions marketed as Turkish Viagra (“no sleep!”) or some other aphrodisiac or variation thereof (including the bottle with the truly bizarre and more-than-slightly disturbing logo of the silhouetted baby with a huge erection). I seemed to be a particular target for the hawkers, as a foreigner who happened that day to be walking around with two pretty foreign girls. Highly amusing – apparently for the locals as well as for us. Yes, the logo on the lid is indeed a silhouette of a baby with a massive erection. No, I don’t understand either. The unplanned wandering approach also works in the evenings, we discovered: a couple of us spent a great night wandering around the Taksim area, discovering a couple of the locals’ favourite bars. The first bar was a hilarious experience of trying to hold conversation over incredibly loud live music as the only other five patrons (all male and slightly older) hit the dance floor for some typically Turkish dancing. The second – Beer House – was a cool little bar entirely open to the street on one side, with a slightly younger crowd; I’m sure we were the only foreigners there, observing everyone enjoy the karaoke-with-a-live-band. Even if walking is not always your thing, perhaps water is. In that case, Istanbul has you covered as well, with plenty of the blue stuff all around the city. Having been cooped up in London for much of the last three years, I think I’d sometimes forget quite how much I enjoy the water. As it happens, I didn’t end up jumping in it at any point in Istanbul (that would come aplenty later on in my journey around Turkey), but just having it around was satisfying. 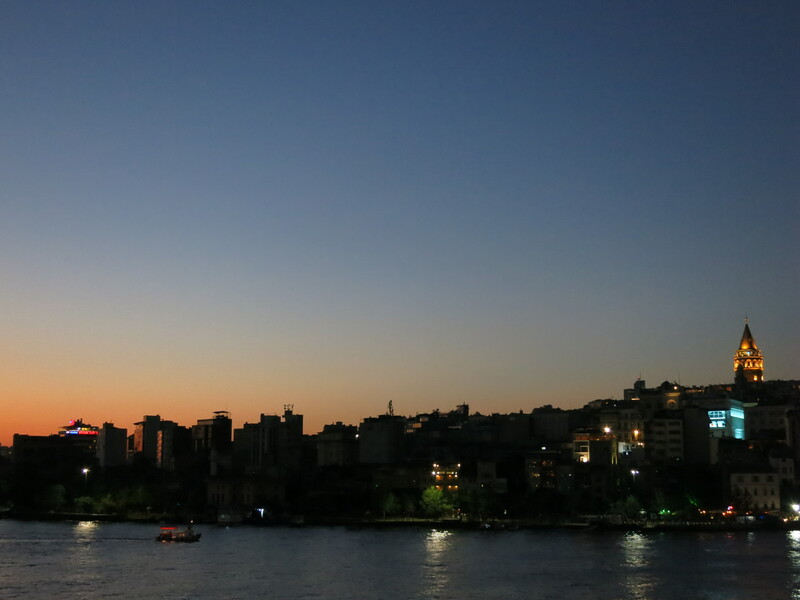 Especially looking out across the Bosphorus while enjoying a nice rooftop beer up on the terrace on the top floor of my hostel. What does that have to do with walking around Istanbul? A fantastic way to rest the feet and end the day, that’s what. Surrounded by blue seas, and inspired to walk it all again tomorrow. Sunset over the water to inspire the next day’s wanderings.